IFA 2011: Sennheiser launches RS 220 high-end wireless headphones | What Hi-Fi? Sennheiser has launched a new flagship pair of wireless headphones, which it claims will match the performance of high-end wired rivals. 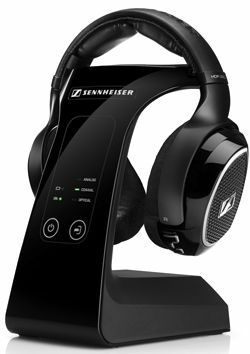 The Sennheiser RS 220 uses digital transmission coupled with an open-back headphone design. "With these digital wireless headphones, we have succeeded for the first time in combining wireless music enjoyment with high-end quality,” said Maurice Quarré, Director Product Lifecycle Management at Sennheiser Consumer Electronics. The rear of the transmitter unit (pictured below) features a range of inputs, including stereo RCA, digtial coaxial and digital optical. A set of RCA cables and a digital coaxial cable are included with the headphones. The Sennheiser RS 200 headphones are powered by a pair of NiMH batteries, which recharge on the transmitter base unit. It's claimed each charge is good for 6-8 hours of listening time. The headphones weigh 329g, and feature an adjustable, padded headband. The Sennheiser RS 220 wireless headphones should be in shops later this month. A price has yet to be announced, but this new model sits above Sennheiser's continuing RS 180 wireless design, which costs £220.